The 7 x 7 Chelsea Deluxe Corner Summer House is a contemporary corner summer house with a fantastic space-saving design that will make use of a spare corner in the garden. The summer house would make a fantastic outdoor dining or relaxation space for all the family. 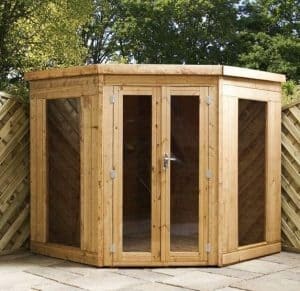 There is a lot of quality built in to this corner summerhouse. 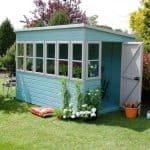 The design is clean and attractive, so you have a building that adds plenty of value to your garden. There is also a clear quality aspect too, with 12 mm tongue and groove cladding and floor work as part of the construction. This ensures you have heavy-duty protection against rot. The 7” x 7” building has a pent roof and mineral felt roofing, so you can be assured that rainwater will not be an issue. In addition, you also have a building that has two large doors. The floor to ceiling glazed windows and doors allow light to flood the interior, making this summer house and bright and comfortable environment in which to relax. Enjoy fabulous, uninterrupted views out into the garden whilst you sit and relax or dine in style with friends and family. A corner summer house has a specific design and purpose to make use of an unused corner in the garden. This deluxe building has much to offer the smaller garden and would serve as an ideal sun trap in which to dine or relax all year round. In this section we have a look at the Chelsea’s features in further detail and discuss how the summer house may be used and enjoyed to its full potential. 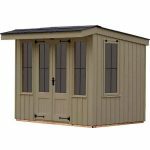 Exterior: The Chelsea Deluxe is an attractive, contemporary styled garden building that would look at home in any style of garden. The natural, FSC certified timber provides a sturdily built summer house, thanks to the 12mm tongue and groove cladding. The pent-style roof is covered in green mineral felt material that will both ensure a long life and protect from water and weather damage. Interior: It is worth noting that due to the corner shape of the building, the space may not suit everybody’s needs depending on how they wish to furnish the inside. However, thanks to the 7x7ft interior space, there is plenty of room in which to place seating or a dining table set. Windows and doors: The floor to ceiling windows and glazed double doors are made from 2.5mm styrene glazing and are the main feature of the building. The frontage is entirely glazed, meaning that the interior is bright and airy, whilst providing fantastic views out to the garden. Security: The summer house comes with an integrated lever sash lock to keep the door firmly shut and ensure that the interior contents remain secure whilst not in use. 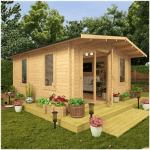 7 x 7 Chelsea Deluxe Corner Summer House: How easy to build? The manufacturers of the Chelsea summer house have ensured that the assembly process is as simple and straight-forward as possible for its customers. 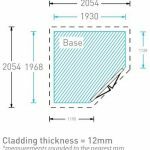 The product will arrive at your door in flat-packed form, in a package containing all of the timber panels, glazing, fixture and fittings required; all that is needed is a basic tool set. A step-by-step instructions manual with clear diagrams is included to ensure that you stay on the right track. 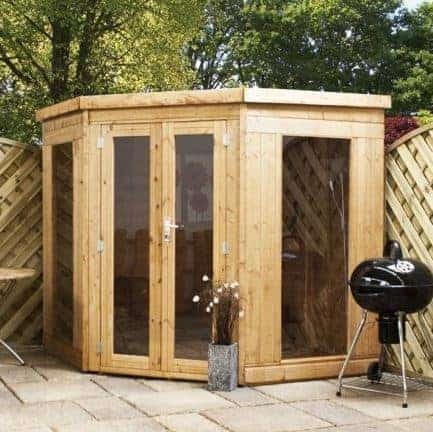 It is recommended that two people assemble the summer house together, for safety reasons and due to the size of the panels and glazing. 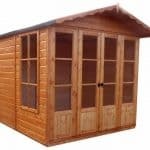 7 x 7 Chelsea Deluxe Corner Summer House: What is the overall quality like? On first impressions, the design and quality of the Chelsea summer house is clear. With 12mm tongue and groove cladding construction for the wall panels and flooring, the house is both sturdy and weather resistant. 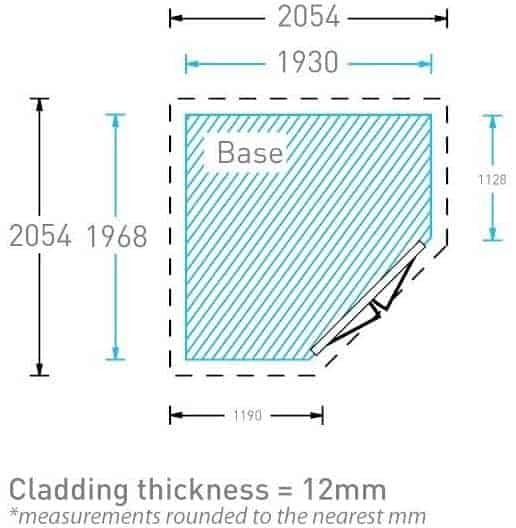 The FSC timber carriers a 10-year anti-rot guarantee from the manufacturer, so long as the building is well maintained throughout its lifetime. The pent roof is covered in green mineral felting to, again, protect the summer house from the elements and water damage. 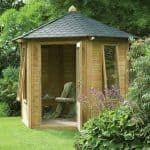 The natural wood appearance that the summer house is supplied in is very charming and would blend into any garden with ease. 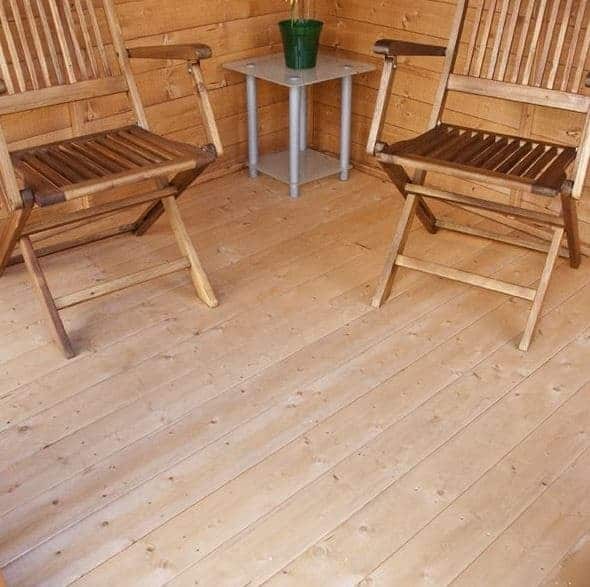 However, a free wood treatment is available at the time of purchase in a range of four various garden shades should you wish to personalise your summer house. If you have a small to medium-sized garden, you will know how precious every square of gardening space is. 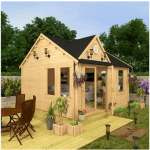 The 7 x 7 Chelsea Deluxe Corner Summer House is a product that will allow you to enjoy the best of both worlds; a summer house without taking up space in the main garden area. The floor to ceiling glazed frontage provides wonderful views out to the garden, and can be enjoyed all year round whatever the weather.